The rumours that there is a love relationship between Prince Harry and actress Meghan Markle of the "Suits" tv series proved to be right. 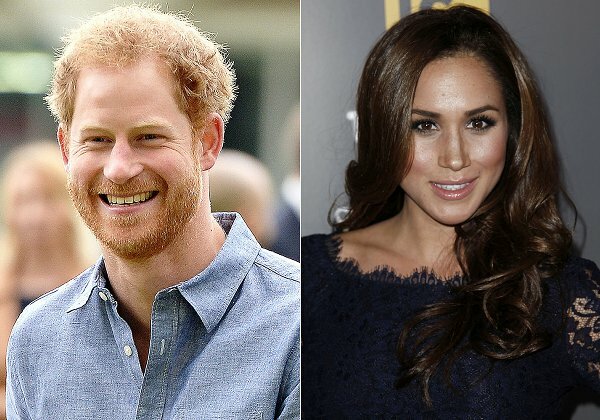 Prince Harry confirmed their relationship continuing for a couple of months and Kensington Palace published an official statement relating to the relationship after the news that came out in the media. Prince Harry said that he took the decision of making that statement because the press harassed Meghan Markle and her family's private life. He said "Prince Harry is worried about the safety of Markle and he is sad because he could not protect her. It is not fair that Meghan Markle is under attack by the media related to their relationship that has left behind a couple of months.". Because of reasons like Markle is older than the Prince and she got married before and divorced, the English media published news telling that Markle is not "fit for" the Royal family. 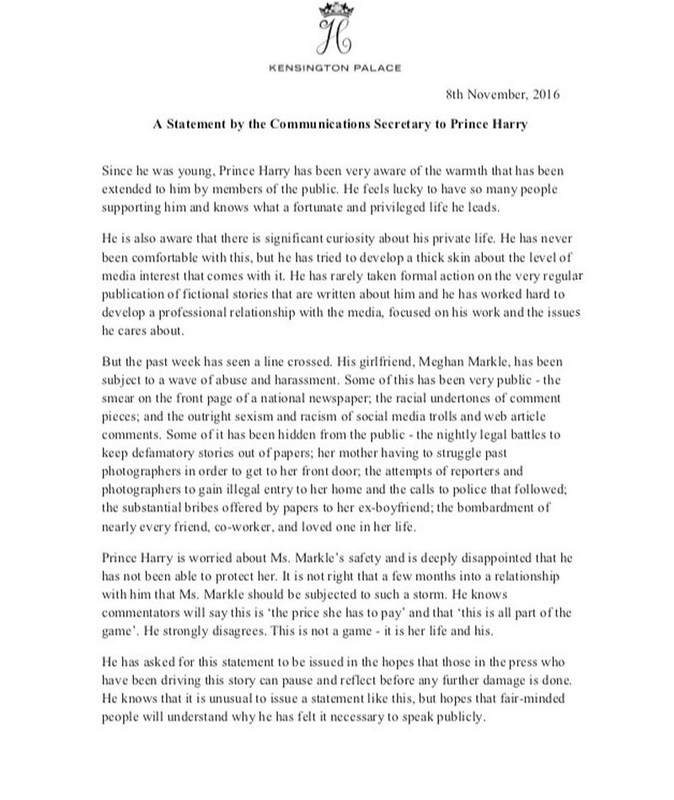 Prince Harry threw some light on the rumours by making a statement for the first time regarding the relationship. .. A Prince should protect her girlfriend just like that. Her birthday is interesting: August 4th. Same as Queen Elizabeth, the Queen Mother and President Barack Obama. Also, her full name is Rachel Meghan Markle. She was born in 1981 and is 3 years older than Harry. Her face reminds me a little bit of Pippa Middleton. Agreed. Is Harry looking for a Kate look alike? The world is full of them Hal! Exactly right! Pippa Middleton was my first thought. Oh my , English royal rules! It is 21 Century and I am pretty sure if Prince Harry would want to marry her he would . Yes and after three of the Queens children got divorced themselves, even future king, divorce should be no issue in that royal family. She made a mistake by posting pics on her Instagram. She should have known the press would jump. She is an actress and should know. I think she wanted it known but it backfired. I say good luck to them both! He deserves to be happy! ‘Love is blind, and lovers cannot see the pretty follies that themselves commit,’ Shakespeare wrote. Here we have a prime example. I am glad you like it Diane. You are smart lady because for few as I know was somehow hard to understand that saying. He's made himself look like an idiot, and she's loving all the attention and financial rewards it brings! Why, he is not looking for a princess of a nobel,girl. This,one is 35' already married before, for a part black. Where is going the stamboom in the future? @ Maya N. what a archaic mentality you have. I agree with you Maya. @ Kristina, what the problem with being Archaic? It is a free world and people are entitled to be archaic like you are entitled to be progressive. 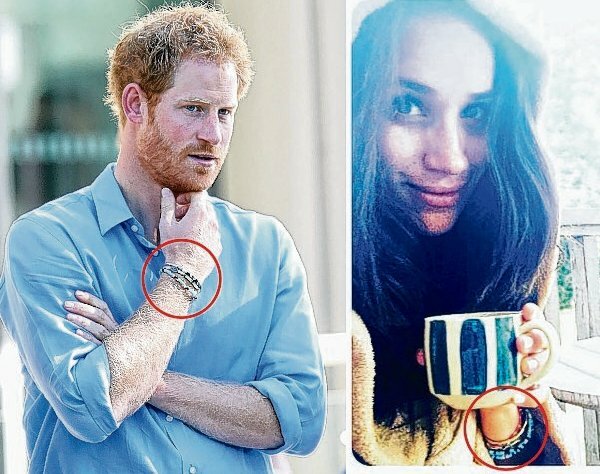 The fact is that both Harry and Meghan are public figures, one through inheritance, the other through choice-more than a million people following her day-to-day existence via social media-and that comes at a price. I think she's just using him for publicity, there's no way that she's going to give up her career that she worked hard for, all of her business deals and much more to become a smiling royal stepford wife in the British 'firm' this woman is milking Harry for all he's worth and when she's done with him she's going to chew him up and spit him out for her 15mins of fame. I don't have a doubt in my body that she was the one who told the press about their relationship. Poor Harry is so gullible and emotionally insecure because of what happened to Diana that he's desperate for love and this girl has him entangled in her web of deceit! Well, she is pretty. Obviously loves attention and showing her body (to everyone). She's probably not the next literature/physics/whatever Nobel candidate or the brightest light on the Christmas tree but doesn't really need to be either so who cares. I just wonder if she is so bothered by the attention why did she posted those stupid pictures. One might think it was intentional. Oh wait, after this Kensington Palace statement no one is supposed to say anything slightly bordering negative about her because that immediately makes you racist. There wasn't any racism in your comment? Are you a person of colour? Doesn't matter, you just buried yourself between the terrible hordes of racist people. The race card has been played very much on some blogs I follow. Not to the degree that I find racist. Just in a general discussion of change for the monarchy but some called everyone a racist for even saying she is biracial. WHY? It is a fact! Just like she is an actress, she lives in Toront, she has a travel blog, she is a feminist etc etc etc. So yes ZL some have picked up that card and run. But we cannot run from the facts. I care not. Let them be happy. But I do think she should stop posting 'hints'. Also theg keep saying she is a household name in the States. No. No she is not. It is not a widely watched channel and I never heard of her until this happened. None of my friends in any age group knew who she was not did my 3 children who are 23 25 and 27. They had not a clue. I wish them all the happiness, I'm just strongly convinced this enormous love is either PR-team orchestrated or comes from plain wish of the attention a royal lover gets. 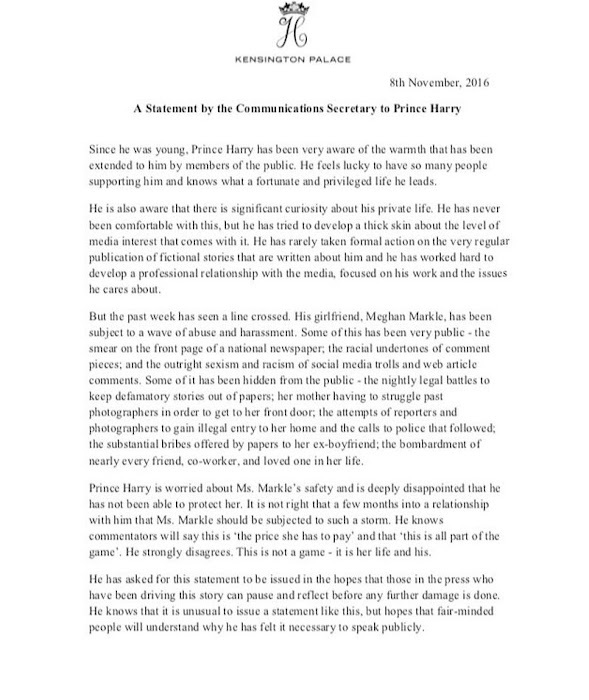 She so obviously wanted it out and therefore the KP statement is just a nauseating, manipulative dodge that suggest the Prince and/or his PR team think people are stupid. She looks so much like Pippa !!! I am just amazed at some of these comments. This is precisely why Harry is having trouble finding love. First of all, she is lovely and is, in my opinion, much prettier than Kate or her sister Pippa (if that matters at all). Harry seems to be serious about her and all these snarly comments make many of you sound like you are jealous. Why on earth would anyone do that. Why comment that he is looking for someone who looks like Kate? This woman is gorgeous and I wish them the best. Ok, I'd really like you to stop this now. What we all see and know is what everyone sees and knows from the newspapers, but you know nothing about any of the commenters here and this blog is not about any of the commenters so you just have absolutely no right to say those things about any of the commenters! We don't necessarily agree with each other but you just can't say XY is jealous because he/she said something you don't agree with! And really, NOBODY compared her beaty to Kate's or Pippa's. Literally nobody up here in the comments! For the record, I think we have no idea why Harry has trouble finding love, if he has at all (because look, he allegedly just did!). I personally think that if he has it is either because he's looking for it in the wrong places or that he's just looking for a nice body and a pretty face, not necessarily to marry said body and face. I think that Cressida girl was very pretty and she looked like she really loved Harry (from what you could see on their photos). And I think Chelsy, though a less pretty face, she seemed strongly to be a smart and funny and down to earth girl. So yes, he can and did find love, suitable ones. I don't think she is pretty, she is a bit manly.